The Spanish Verb Wheel is a double-sided aid introducing 60 frequently used Spanish verbs with an irregular conjugation. 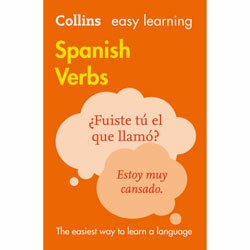 Both sides of the disc also include simple grammatical charts describing the conjugation of auxiliary verbs, composite verb forms and personal pronouns. The Spanish Verb Wheel is a suitable aid for all learners of Spanish at any age or level. Product as advertised and delivered promptly and packaged securely. No hesitation in placing future orders with this Company. Great for 'old' grownups too! I bought this for a trip we are making to Spain in September - we are both over 60 and learning Spanish for the first time. The wheel is a tad on the big side but luckily we don't get embarrassed easily. I also bought other wheels for 'vegetables and fruit' 'clothes' etc and all these language aid wheels are such fun to use. A great company, great service and really reasonable prices.